Space is limited! Previous attendees qualify for a special rate $599.00! Join Dr. David Burns this summer in Calgary, AB, for his fabulous four-day intensive on the treatment of depression and all of the anxiety disorders with advanced CBT and TEAM Therapy techniques. This intensive training offers unique and exciting learning opportunities. Here’s why: The group size will be strictly limited, providing you with an intimate and interactive learning environment. After Dr. Burns describes and illustrates a technique, such as the Interpersonal Downward Arrow, Five Secrets of Effective Communication, Paradoxical Agenda Setting, Hidden Emotion, Externalization of Voices, or Acceptance Paradox, you will have the opportunity to break off into dyads and triads to practice the technique with colleagues and receive immediate and helpful feedback on how you did. You will have chances to work on your own personal and professional issues as part of the learning process if you choose to do so. As therapists working in the trenches, most of us feel anxious, frustrated, ashamed, burned out, inadequate or demoralized from time to time. This personal “patient” experience will boost your morale and make these techniques jump to life for you on a much deeper level. You will learn how to transform your own angst into joy, and you will become a more sensitive and effective clinician as well. 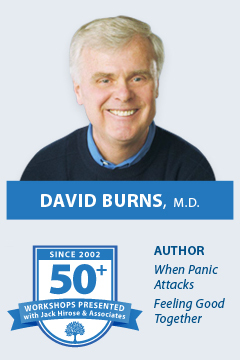 In the past nine years, over 2000 therapists have attended Dr. Burns’ four-day intensives in Canada. Based on the many phenomenal participant testimonials we’ve received, I think it is safe to say that this promises be one of the most vibrant and inspirational training experiences of your career. Complimentary Lunch on Day 1 & 3! We are pleased to offer attendees an optional complimentary lunch buffet on day 1 and day 3 of the intensive. Please note, this is for workshop attendees only. For more information including a list of recent, peer-reviewed, relevant references that provide empirical support for each of the four aspects of the TEAM-CBT treatment/training framework please visit The Feeling Good Institute website. The most common therapeutic error of all—and how to stop making it! Those who have previously attended a Burns 4 Day CBT Intensive with Jack Hirose & Associates are eligible for a special rate of $599.00. Please email registration@jackhirose.com. To receive the early bird rate, registration and payment must be received by Monday, July 1, 2019.